Hob Nob farm has made the switch from sheep to Boer goats. The neutered goats are used for brush maintenance and provide Hob Nob border collies great opportunities to work on their herding skills. 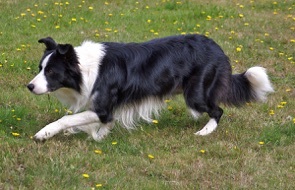 Living in the country provides Hob Nob border collies with many opportunities to work livestock other than our Boer goats & chickens as I am often called to bring my dogs to 'round up' a neighbor's loose farm animal. Hob Nob border collies and the Boer goats also provide occasional work around the community by doing brush control. 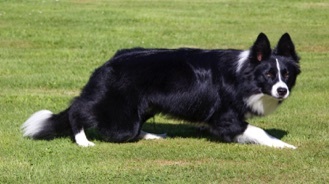 In this way, the border collies are kept quite busy working throughout the year! Pictured below is Team Hob Nob that are a great asset to all the needs to be done on the farm!